‘Volunteer of the Month’ Congrads Beau Hodge! Saturday is Day at the Beach. Mahalo Beau. Most of you have seen and heard contest announcer Beau in action as a big part of our events with his water skills and knowledge as a Key Leader with our surfing and water safety. What many of you may not is his instrumental role ‘behind the scenes’. For the past three years Beau has been a very active Board of Directors member. He has generously given his time to help AccesSurf grow as an organization. Beau, we thank you with all of our heart for your incredible service to AccesSurf. Come join us for our monthly DAY AT THE BEACH event this Saturday. Start the New Year off right by sharing the beauty of the ocean with others. 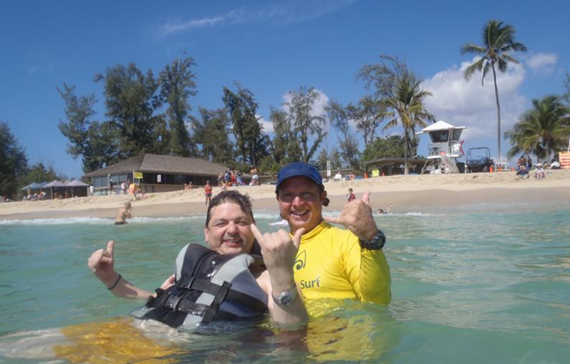 Sign up for Surf News Network’s new premium membership option and 5% is donated to AccesSurf!